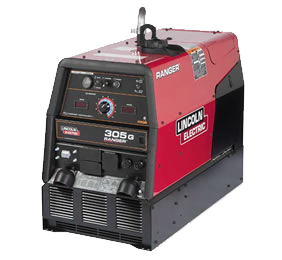 Gas Welder-Generators | R.J. Kates Co.
Lincoln Ranger 350G The Ranger® 305 G is a powerful multi process stick, TIG, wire and pipe welding engine-driven welder that is ready for all day, everyday performance. The Ranger 350G has excellent DC multi-process welding for general purpose stick, downhill pipe (stick), TIG, cored-wire, MIG (CO2 and mixed gas) and arc gouging. It’s the only compact gasoline welder in North America rated at 29V for 300 amps of stick or CV welding. It handles CV wire welding with up to 5/64 in. (2.0 mm) diameter electrodes. The Miller Trailblazer 275 and 325 delivers processes of X-Ray quality. These processes include Stick (SMAW), MIG (GMAW), Flux-Cored (FCAW), DC TIG/Pulsed TIG (GTAW/GTAW-P), Air Carbon Arc (CAC-A) Cutting and Gouging (rated: 3/16-inch carbons; capable: 1/4-inch carbons*), Air Plasma Cutting and Gouging with optional Spectrum® models (rated: 5/8-inch mild steel). Note: the asterisk marked comments are available for the 325 models only. 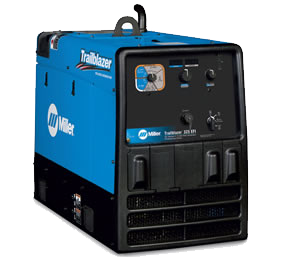 The new Trailblazer has been engineered to provide high-quality welds across a variety of applications knowing quality welds begin with a quality arc. That’s why there has been significant improvement to the performance for all welding processes and made it easy to fine tune the arc to match your personal preferences and welding style. There are now three Stick modes, two Wire modes, three TIG modes, a TIG Pulse mode, and infinite arc control available in the Stick and Solid Wire modes for easier fine tuning of tough-to-weld materials and out-of position applications.